Darrel Lee Carpenter, 68, Nevada, MO passed away on Wednesday, February 06, 2019 at Medicalodges of Nevada. Darrel was born April 27, 1950 in Bartlett, KS to Floyd Harvey Carpenter, Sr. and Julia Belle (Miler) Carpenter. Darrel attended Walker High School and graduated with the Class of 1969. He served in the United States Army in Vietnam from 1969-1972. Following his service years he came back to Nevada and worked in various jobs including the Nevada State Hospital for a number of years. 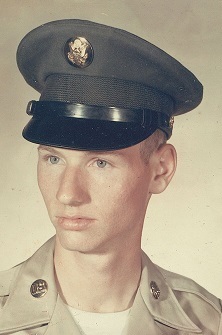 Darrel also served in the Kansas National Guard for several years. Survivors include his mother, Julia B. Carpenter, Nevada; siblings, Bradley Carpenter, Milo, Floyd Carpenter, Jr., Nevada, Janice Williams, Mississippi, Margie Wardin, Nevada, Sarah Wyrick, Lamar, Daniel Carpenter, Nevada, Hal Carpenter, Milo, Larry Carpenter, Nevada, Terry Carpenter, Nevada; numerous nieces and nephews. He was preceded in death by his father Floyd; three brothers, Randall Carpenter, Carl Carpenter, Earl Carpenter; one sister, Kathy Keith; one sister-in-law, Margie Carpenter. Funeral services with Military Honors will be held at 2:00 p.m. on Monday, February 11, 2019 at Ferry Funeral Home in Nevada with Pastor Dennis Engelbrecht officiating. A private committal service will follow at Moore Cemetery in Nevada. The family will receive friends from 4-5 p.m. on Sunday, February 10, 2019 at the funeral home. Memorials are suggested to the Family in c/o Ferry Funeral Home in Nevada.